Tony Blair has refused to give a timetable for his departure as prime minister, saying it would "paralyse the proper working of government". He insisted he would give "the time properly needed for my successor to establish himself". He said some of those calling for him to go wanted to "radically change the direction of policy and not to renew Labour but to reverse it". He refused to say if he had discussed the succession with Gordon Brown. And he said suggestions that he had sacked Jack Straw as foreign secretary over differences with the United States about Iran were "rubbish". He said Mr Straw was "an outstanding figure" who had agreed with the prime minister after the last election that he would stand down as foreign secretary "at some point". The remarks follow claims that Mr Straw's demotion was a consequence of him ruling out military action against Iran. Mr Blair said Mr Straw was the best person to tackle the "really, really, difficult" job of House of Lords reform. But he added that he had chosen Margaret Beckett to succeed Mr Straw because she was "an outstanding politician" and "a very, very safe pair of hands". "I have absolutely no doubt that the same policy articulated by Jack will not change one iota under Margaret," he said. He made the comments at his monthly press briefing, just hours before he is due to address backbenchers at the Parliamentary Labour Party. 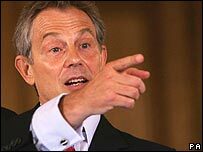 Referring to his pre-announcement in 2004 of his plans to step down without fighting a fourth general election, he insisted that "whoever succeeds me has to have the time to bed in and lead the policies of change up to the general election". He said that unlike former Conservative Prime Minister Margaret Thatcher he had "no intention of going on and on and on". But he said: "To set a timetable now would simply paralyse the proper working of government, put at risk the necessary changes we are making for Britain and damage the country. "It wouldn't end this distraction, but it would take it to a new level." He warned critics on the Labour backbenches that any attempt to reverse the New Labour project would consign the party to opposition. He said he would reassure Labour MPs that "there will be a stable and orderly transition to a new leader", but it was also in the interests of the party in the meantime to "get on with the business of government". He would not comment on any discussions he had had with Mr Brown, but said he was sure he would not take the Labour Party in another direction. "I have no doubt at all he will be absolutely New Labour to his finger tips," he said. But Labour MP Geraldine Smith told BBC News 24 she thought Mr Blair should sit down with the chancellor and "reach some sort of agreement". "After all, he has caused this problem by saying, for some reason that none of us can understand, that he won't fight the next general election, that he would stand down sometime during this Parliament," she said. Mr Blair also defended Deputy Prime Minister John Prescott, saying he was one of the best people to cut a deal across government. He dismissed criticism about Mr Prescott being able to keep hold of his salary and perks following the Cabinet reshuffle which saw him lose his job running a department. He said Mr Prescott would be chairing committees, which was a job which was "rather more than sitting down and nodding to people to come in".